Central Teacher Eligibility Test or CTET is an exam conducted by CBSE ( Central Board for Secondary Education) for the aspirants, who wants to set their career in Teaching field for Central Government Schools. CTET exam is All India Level Entrance Examination conducted by CBSE. This exam is conducted twice a year. Candidates can apply for CTET exam 2018 through official website. The candidate should fill all the details required for filling the CTET Application Form 2018 and upload their scanned images of latest photograph & signature. Before applying for CTET 2018 online form, please ensure all the related dates for filling application form on time. 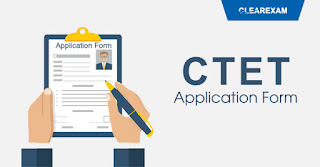 CTET Application form last date is 27/08/18. candidate must ensure to have Scanned image of latest photograph and signature in JPG format only, for uploading at the time of form filling. CTET 2018 Exam date is out and is going to be held in the month of December 2018 and candidates can apply online for CTET 2018 through the official website. Candidates are suggested to keep the password secure & safe to his/her knowledge without sharing with anyone, to avoid any fuss. Scanned photo and signature uploading are mandatory. Scanned signature size should be 3 - 30 KB. Candidate must have hard copy of confirmation page for record and keep it for their reference. Confirmation page is not required to be sent to CTET unit. The portal is opened from 30/08/18 to 02/09/18 for uploading the photograph & signature of candidates who are registered already on or before the last date (27/08/18) for CTET Exam 2018 but didn't upload their photograph & signature. Now, they can remit their fee through debit/credit card, net banking or E-challan from 30/08/18 to 02/09/18 till 2:00 p.m. all such candidate can complete their online form by uploading photograph & signature within stipulated time. No further extension will be given in this regard.